Newborn health is ruffled for days after the ordeal of child birth process. The mechanical strain and stress experienced by the neonates leaves them almost in a state of shock. Passage through birth canal is known to be the most dangerous journey of life. Unfortunately, till date, no one ever thinks of what babies go through during the child birth process. Neonates go through major transition from intrauterine life to extrauterine life. First few minutes after birth are most crucial for newborn's health, when the pattern of breathing and blood circulation change dramatically. This is followed by marked physiologic transitions in baby’s organ systems. Neonates are very sensitive to external stimuli during the first week of life. This helps the newborn infant to learn to respond to many forms of external stimuli. Many of the newborn health problems are related to neonate’s poor adaptation to the extrauterine environment. 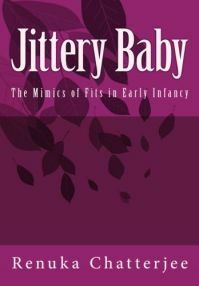 The pliability of newborn’s bones makes it possible to squeeze through the narrow birth canal usually without any injuries to the mother or to self. Even so, birth traumas do occur. - Also read "Effect of Vacuum Assisted LSCS (Caesarean Section) Delivery on the Baby"
Skull is made of several soft bones joined together at sutures. Sutures lines give the skull bones flexibility. They form fibrous joints of the bones of the skull. In newborns the fibrous tissue of the cranial sutures is very soft and pliable as compared to that of older children. It prevents skull fractures when a baby’s head is squeezed as it progresses down the narrow birth canal. This results in to head molding without causing injury to underlying brain tissue. What is newborn head moulding? Newborn head moulding is a common occurrence during the passage through narrow birth canal. The head of a newborn acquires oblong form rather than round. Head moulding reverts back to normal shape on its own accord after a few days, without any effect on newborn health. The head of an infant born by caesarean section or from a breech presentation do not undergo moulding and is characterized by its roundness. Why do some neonates have asymmetrical shape of head? Moulding of the pliable cranium is also noted as a flattened area of the skull, when a neonate consistently assumes his preferred sleeping position. Resultant flattening of the skull bone shows as asymmetry of the shape of young infant’s head. Asymmetry of newborn head attributed to head molding is only a temporary phenomenon. Skull eventually attains its normal symmetrical shape. Overriding of sutures is another cause of asymmetry of newborn head. It actually implies overriding of skull bones at suture lines, which is felt as a ridge of bone when examined by passing fingers over the cranium. 3.) Craniosynostosis: Premature fusion of cranial sutures. It is identified as a hard fixed ridge over the suture and an abnormally shaped skull. Cranisynostosis can hinder brain development of young infant and so needs early medical management. Caput succedaneum is a boggy edematous swelling in the skin of the scalp. It occurs in the babies who are born of vaginal delivery with vertex (head) presentation. It occurs as a result of mother’s soft tissue pressure on the presenting part of the baby. The swelling is not confined to any particular skull bone. It crosses the suture lines. May have some overlying bruises, especially if vacuum cup is used to pull the baby out. The edema subsides completely in 2-7 days on its own accord. Local medications, massage, cold/hot compresses or pressure are highly discouraged. Caput succeedaneum and head moulding during child birth go hand in hand. It is the commonest hematoma (collection of blood) of scalp (the skin of head) seen in newborns. 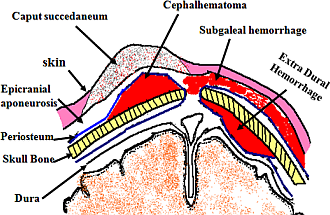 Bleeding occurs between the skull and the periosteum (subperiosteal space) of a newborn baby. Usually follows an instrumental delivery, prolonged second stage of labor, and though rarely may even occur due to normal spontaneous vaginal delivery. Hematoma is limited by each cranial bone and is often associated with hair line fracture of the underlying bone. Develops gradually after birth during the first day of life. Bleeding stops spontaneously due to the pressure of accumulated blood in the closed subperiosteal space. Does not cause discoloration of overlying scalp. i.) Amount of blood loss and signs of hypotension (low blood pressure). ii.) Ill effects of anemia due to blood loss. iii.) Exaggerated neonatal jaundice due to reabsorption of the blood clot. Hematoma gets organised and calcified leaving a hard swelling with soft center, which can be mistaken for depressed fracture. Cephalhematoma resolves on its own over few weeks. The birth cry is quoted in literature as “a cry of wrath at the catastrophe of birth”. Flood of emotional concern is generated in the new parent in response to their newborns first expression. The soothing that follows gives the baby her first pleasant experience in this strange extrauterine world. To the attending medical staff, the loud first cry is a sigh of relief. It indicates good newborn health and successful transition of the neonate from intrauterine to extrauterine life – a very crucial step. The birth cry is the result of atmospheric air gushing in to the baby’s lungs to initiate normal respiration to sustain extrauterine life. Later on baby uses cry to communicate her needs to the parents. Crying is one of the baby's ways of communicating and ensuring a response from their environment. Poor health of the mother. Extremes of mother’s age; too young or too old. Grand multiparity; more than 3 pregnancies in the mother. Twins; particularly with the second twin. Premature or low birth weight babies. Abnormal intrauterine position/presentation of the baby. Disproportion of baby’s head and mother’s pelvis (cephalopelvic). Large head of the baby due to any cause. Non-progressive second stage of labor. Newborn health related pages are tabulated in the right column.